It’s not surprising that abdominal bloating is a relatively frequent digestive complaint. It can be triggered by diet, lifestyle and certain chronic health conditions, and often it appears along with common digestive problems, such as constipation. Whether you experience this inflated, tight-bellied feeling regularly or rarely, it’s not always easy to pin down the cause. Although certain foods are widely associated with bloating, other foods -- including those that generally promote digestive health, like tomatoes -- can cause bloating in some people. Tomatoes are widely recognized as a wholesome, low-calorie source of vitamin C, potassium and beneficial antioxidants. With their moderate amount of fiber and high water content -- the fruit provides about 2 grams of fiber per cup and is almost 95 percent water by weight -- tomatoes promote digestive efficiency and bowel regularity. These generally positive attributes can trigger bloating, however, particularly if you consume large quantities of tomatoes or your diet is otherwise low in fiber. Bloating caused by water is typically short-lived, while bloating brought on by a sudden increase in fiber is often accompanied by intestinal gas. 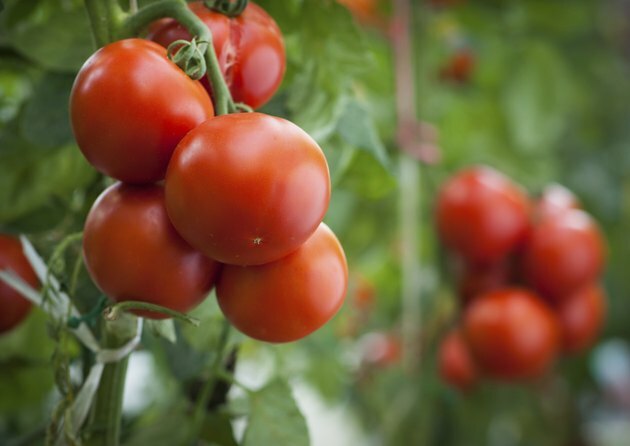 Despite their high water content, tomatoes are relatively acidic. If you have a sensitive stomach, eating tomatoes could irritate the lining of your stomach, triggering inflammation and minor bloating. Experiencing significant bloating after eating tomatoes, however, might be a sign of an intolerance -- a chemical response that may only occur after eating a certain amount of the problematic food. Like dairy products, chocolate and citrus fruits, tomatoes are a common cause of food intolerance. Food intolerance, in turn, can cause of bloating and distention, or a visible increase in abdominal girth. Tomatoes may be more likely to trigger bloating in the presence of common underlying digestive disorders, including irritable bowel syndrome and gastroesophageal reflux disease. Although IBS is a complex problem that isn’t well understood, food intolerance is thought to trigger common IBS symptoms, including bloating, in some patients. Tomatoes and other acidic foods have been known to provoke GERD symptoms in some people. Also known as acid reflux, GERD occurs when a weak esophageal sphincter allows the digestive juices in your stomach rise up into your esophagus. Although this usually leads to heartburn, it can also trigger other gastrointestinal symptoms, including bloating, particularly for the high proportion of GERD patients also affected by dyspepsia, or indigestion. You don’t have to have a digestive disorder or food intolerance to wind up with a bloated belly after eating tomatoes, especially if you typically consume tomatoes in the form of sauce. Like tomato juice and other concentrated tomato products, tomato sauce tends to be very high in sodium -- the average 1-cup serving has over 1,100 milligrams of sodium, according to the U.S. Department of Agriculture. High-sodium foods promote water retention, which can lead to temporary bloating, particularly for people who are sensitive to the effects of sodium. Keeping a detailed food diary can help you discover whether your bloat is caused by tomatoes or some other component of your diet. Wellness Foods A to Z: An Indispensable Guide for Health-Conscious Food Lovers; Sheldon Margen, M.D. Are Tomatoes Bad for Weight Loss?